The first aspect of Bloodlines that makes it's morality work is simply the game's narrative as well as how it effects player perception. 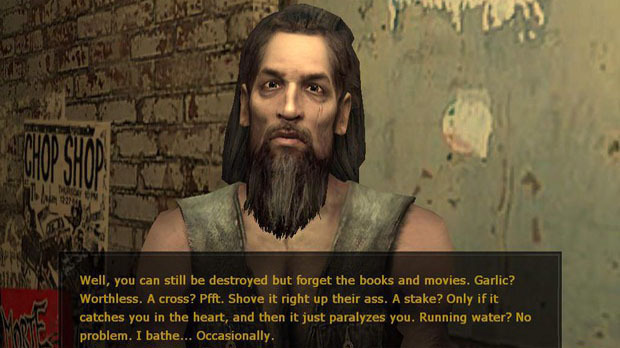 In most games you are playing as a human in a world with human morals. What constitutes a good or bad deed is pretty much identical across every game. Bloodlines is different. In Bloodlines you play as a vampire living in human society. A predator living among his prey, so to speak. While you live among the humans, you are held to a vampire's set of rules. Primary among them is the concept of "The Masquerade". Essentially, vampires must strive to keep their presence/identity hidden. If humans remain ignorant to the vampires among them, vampire life is easier. Because this is the way the world of Bloodlines is portrayed, it's not considered such an "evil" thing to say, off a human if they found out you were a vampire. Which leads us into the gameplay side of things. As a vampire, you can choose to breach the Masquerade if you feel the benefits outweigh the cost. Doing so is to your detriment however, in fact doing so 5 times results in a game over. Which brings us to the topic of humanity. Humanity is the closes Bloodlines has to a traditional morality system. Essentially the player has a certain number of humanity points representing how much control they have over "the beast" inside them. Your traditional good deeds increase humanity, whereas evil deeds reduce it. 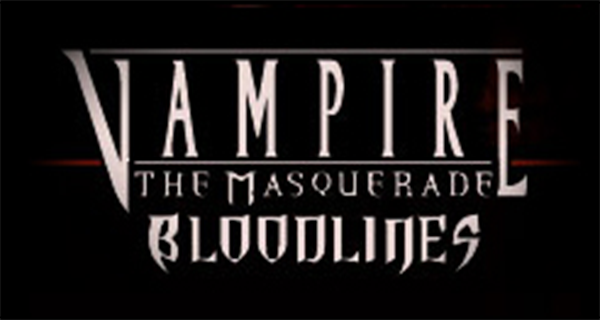 The difference in Bloodlines is in how humanity interacts with the rest of the gameplay, as well as with the Masquerade. For one thing, there is no reward for reaching a large amount of humanity. Instead, humanity is more of a measure of how many evil deeds you can commit before going feral. At 0 humanity you temporarily lose control of your character, but gain a large stat boost. Going feral in front of humans (that is, humans who aren't soon to be dead) is a breach of the Masquerade, but aside from that and the loss of control, there isn't much else that happens. 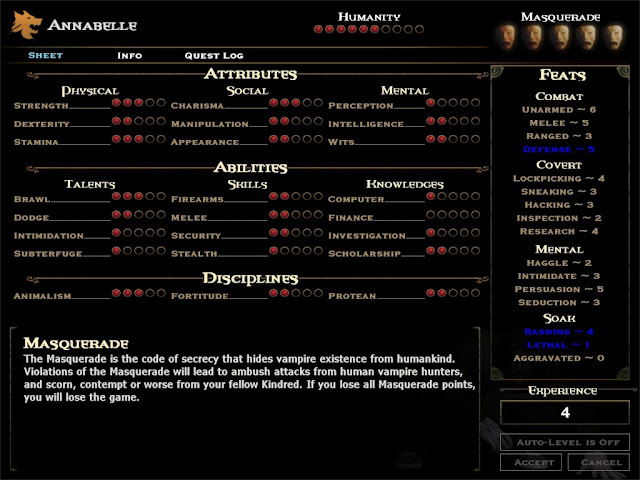 In fact, it's possible to build a vampire specifically designed to go feral to exploit the stat boosts. The game is littered with opportunities for self gain that come at the cost of humanity, and it's up to the player to choose how much they want to go down that path. Some such opportunities can even redeem Masquerade breeches. Maybe you killed an innocent, but they were causing a scene, therefore you strengthened the Masquerade. It's an interesting give and take. The result of all of this, is a game that differs greatly from what we have come to know as the "traditional" binary morality system. Making choices in Bloodlines is always interesting. Your morality isn't directly measured, and your not trying to sprint to one side or another of a single sliding scale. There is no unlocking of SUPER ULTRA GOOD GUY POWERS. Each situation has to be considered based on the situation alone, and decisions often come with a certain level of risk/reward. If anything it's more a practice in min/maxing your opportunities, doing good deeds when you can to pump up your humanity so that you can later dump it doing evil things for personal reward. If nothing else, it's really interesting to have all of this in a world that really feels like you are following vampire ethics, rather than just human ethics in space/fantasy/whatever. All this, from a game released in 2004.